The rate of decrease (that is, the gradient) of pressure in space at a fixed time; sometimes loosely used to denote simply the magnitude of the gradient of the pressure field. Also known as barometric gradient. The change in atmospheric pressure per unit horizontal distance, usually measured along a line perpendicular to the isobars. the change in atmospheric pressure per unit of distance along a normal toward an equal pressure surface (isobaric front) in the direction of a decrease in pressure. 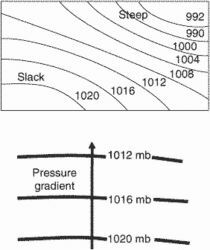 Horizontal pressure gradients are commonly used in meteorology—that is, horizontal components of pressure gradients established at sea level or at another level. In this case, the isobaric normal toward an isobar is taken at a given level. Normally a horizontal pressure gradient is 1–3 millibars per 100 km, but in tropical cyclones the gradient sometimes reaches tens of millibars per 100 km (1 millibar = 100 newtons per sq m). The concept of a barometric grade is often used instead of the vertical pressure gradient. The change in pressure with horizontal distance at a fixed time. The higher the pressure gradient, the faster is the fluid flow. The similarity between the pressure gradients far upstream the U-bend, at -141d and -59d in Figure 8 (a and c), for low and medium mass velocities, attests for the quality and precision of the measurements. The flow is intensified due to the pressure gradient over the Ebro valley (Jimenez et al. Accumulation of the gas occurs under a variable pressure gradient within the system. A hepatic venous pressure gradient above 20 mm Hg 24 hours after presentation is highly predictive of treatment failure in patients with variceal hemorrhage. Postoperatively, the peak pressure gradient across the repaired segment was measured by transesophageal echocardiography. Therefore turbulent boundary layers subjected to pressure gradients is a topic of great technological interest. For all the experimental data points, the acceleration pressure gradients (calculated assuming the separated flow model and the Rouhani-Axelsson drift flow void fraction model) were always less than 5% of the measured pressure gradients. The Table shows quadratic forms fitted to these data, and from these, by differentiation, pressure gradients are estimated. From the affordable R-200 for 50 to 3000 ml flasks, to the top model R-205 Professional with full automated vacuum control, pressure gradients and automatic distillation down to dryness, the user determines the degree of sophistication. Decreased wind speeds are due to decreased pressure gradients resulting from the pressure system moving out of the area. Collapse during SCF treatments is believed to occur because of the high compressive stresses induced as pressure gradients form during pressurization to the SC phase. And whatever rare pressure gradients were present that June day in the year John Brown raided Harpers Ferry could recur elsewhere in the Southland tomorrow.